A Harvard team's breakthrough may make it possible. A fundamental strategy in the war against cancer is to catch it early—before it has spread, when it's easiest to remove. Unfortunately, some cancers, such as brain cancer and ovarian cancer, remain difficult to detect until the end stages. But that's changing. A Harvard team has discovered a simple, noninvasive way of catching cancer early—by looking at a blood component that's been ignored by the medical community for decades. 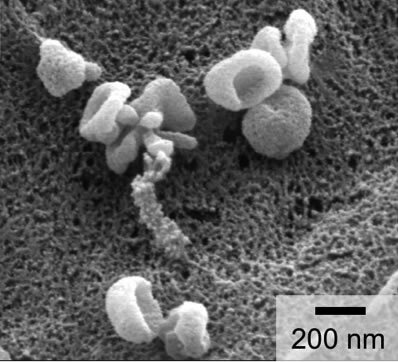 Cancer cells shed saucer-shaped microvesicles (above), which can now be detected in a drop of blood using a handheld device (below). Traditionally, doctors have tried to detect cancer early with high-tech imaging, tissue samples, and surgical exploration. Unfortunately, these techniques often catch cancer too late to achieve a cure, and they can be invasive. A less invasive approach is to look for signs of cancer in the blood. For example, tumors shed cancerous cells into the blood, but in such small numbers that finding them "becomes a needle-in-a-haystack problem," says Dr. Ralph Weissleder, director of the Center for Systems Biology at Massachusetts General Hospital (MGH). Very early tumors also shed proteins, like prostate-specific antigen (PSA), which can be detected in blood to catch the tumor early. But finding tumor proteins in the blood has not, so far, provided major advances in catching cancer early. The new approach to early diagnosis involves something else in the blood: tiny particles or microvesicles. Many kinds of cells shed microvesicles, but the amount shed by tumors is quite substantial. "So you would easily find a million to several billion tumor microvesicles per milliliter of blood," says Dr. Weissleder. Why haven't scientists looked at these before? The microvesicles are larger than proteins but smaller than circulating cancer cells, and because they fall in between the two, they've been discarded as debris for decades, says Dr. Weissleder. "It wasn't until the last few years that people have paid more attention to them and discovered they contain not only imprints of originating cells, but also DNA from tumors and other molecules," he explains. Finding particles that tiny would require a powerful device able to sift needles in any haystack. The usual way to find cancer-related microvesicles requires a complicated lab process that can take days. 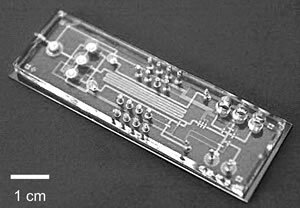 But at MGH's Center for Systems Biology, which Dr. Weissleder directs, he and his team developed a hand-held device that uses a nanotechnology sensor to detect the tumor microvesicles in a drop of blood in about two hours. In a recent study in the journal Nature Medicine, researchers were able to detect these microvesicles reliably in blood samples from both mice and from people with the aggressive brain cancer glioblastoma. The technology has the potential to diagnose cancer early, which Dr. Weissleder says is groundbreaking. "It's opening new frontiers in diagnostics that can save lives. We're trying to figure out how useful it is for other cancers and diseases." The technology also has the ability to measure how effective a person's cancer treatments are before the results can be seen with imaging. This is because the device measures not only the number but also the composition of microvesicles, which changes with cancer treatment. "Within a few hours or days of treatment, you sample the blood and measure how the microvesicle numbers and composition have changed, which indicates treatment response. In the study for brain cancer, the microvesicles went down within 24 hours of treatment," says Dr. Weissleder. Dr. Weissleder and his team don't yet know how early the new technology can detect cancer or how well it can detect treatment response. They are pursuing those answers in clinical trials that focus on ovarian, colorectal, liver, and lung cancers and lymphoma. But the technology is so promising Dr. Weissleder believes it will be available in your doctor's office in the next three to five years. "It's another tool in our quest to fight cancer. No more finding out too late that your cancer has spread. No more waiting to find out how well cancer drugs are working. This is allowing someone to take a drop of blood and give you a real-time readout of the cancer and how you've hit the tumors. It's pretty amazing."